Th-INK-ing of You: ODBDSLC159 Jesus Loves me! Hello friends! 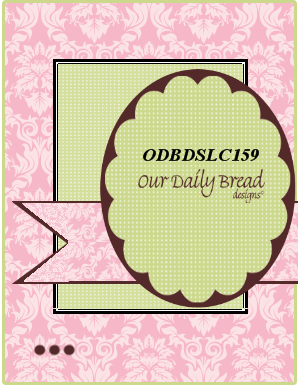 Today I am guest designing for the ODBD Challenge Team! How fun! I work side by side with these talented lades every day and I am thrilled to be joining in this week! To make the challenge even more fun, we will be giving out a prize, a $15 gift certificate to be used toward stamps at the Our Daily Bread Designs store!! Entries for the prize must be submitted by Sunday, June 23 at 8 p.m. EST. One random winner will be chosen and announced next challenge. 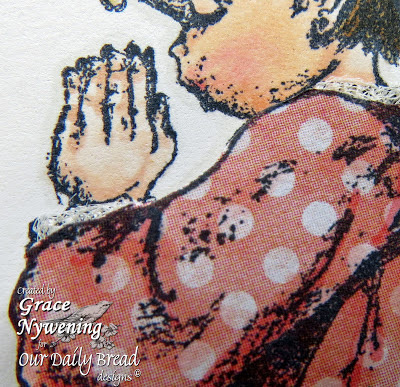 As a way of recognizing those who do use Our Daily Bread Designs stamps, we will again be choosing three or more of our participants for the Shining the Light Award . In order to qualify for this award or join the challenge however, you must use Our Daily Bread stamps and have your submission added to Mr. Linky by Sunday, June 23 at 8 p.m. EST. 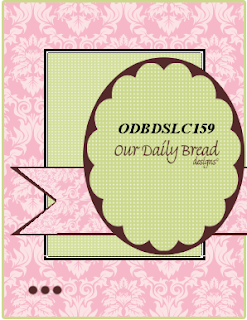 If you upload your creations to Splitcoast Stampers or any other online gallery, please use the keyword ODBDSLC159. When creating your posts on blogs please include a link to the challenge. I hope you enjoyed my take on this week's sketch and that you'll play along! Here is a link to the challenge! Grace, this is beautiful...and as I type I am listening to Sarah Sadler sing "How Deep The Father's Love For Me." How wonderful...I love this darling card! I always love paper-piecing, and you've shaded her perfectly. And I love the lovely arrangement of layers and elegant details, especially that gorgeous/luscious bow! I LOVE it, Grace! WOW!Gorgeous Card!! !Love the colors,the stamp,coloring is awesome!!! Wowzer girlfriend!!! I just love your precious card with the sweet girl paper pieced. Your coloring, choice of colors and papers and the elegant layering with the delish bow is stunning!! Love it!!! Thanks for making a sample for the challenge this week!!! Oh how precious, Grace! Your attention to detail is amazing...love the paper piecing...the lace...and your gorgeous layers and bow! 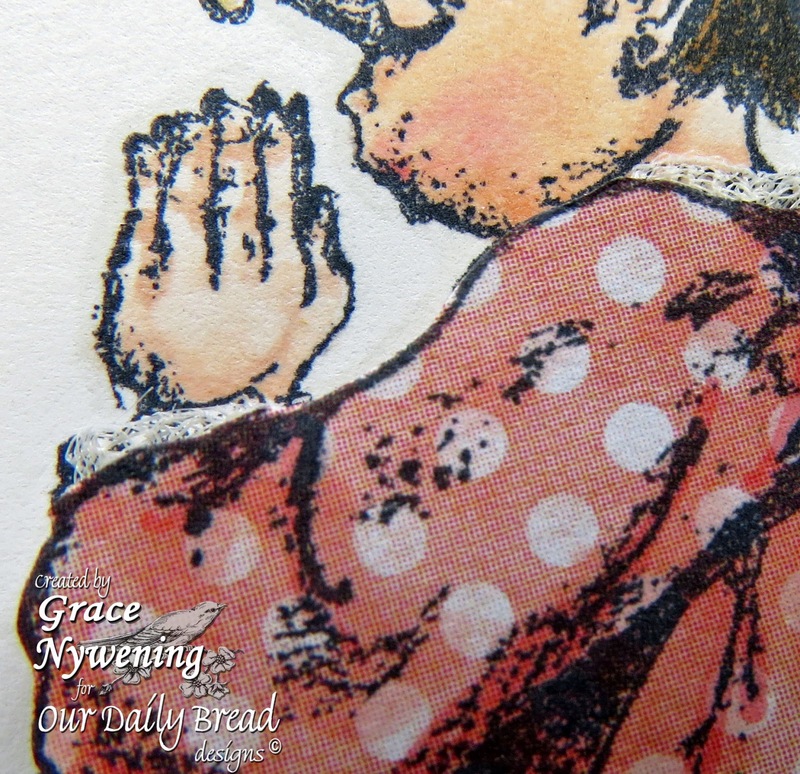 This card is just darling...thanks so much for joining the challenge this week! Hugs! So sweet. I love the paper piecing. Such a pretty card! Such an endearing image and I so love your treatment of it - Little House On The Prairie, eat your heart out!! Such a beautiful color scheme for this precious little girl. Another beauty by Grace! so very sweet, just love the paper piecing, terrific layering! So precious - love the paper piecing and that you colored it to make it more dimensional. You have such a gift for details. What a sweet card Grace..Love how you paper pieced this. Beautiful work! Very, very sweet. The attention to detail is tremendous!! P.S. I love your worship music!